It’s been a pretty sweet start to the year! Why, you ask? I found Truvia® Natural Sweetener on the shelf at my local grocery store! Truvia® Natural Sweetener is a great-tasting, calorie-free sweetener (you heard me – calorie – FREE) that gets its sweetness from stevia – a plant found in nature. What could be better than that? I’ll tell you what – it’s so easy to use, and its versatility makes Truvia® the perfect replacement for sugar in all beverages, snacks and quick daily meals. Just sprinkle Truvia® Natural Sweetener Packets or Truvia® Natural Sweetener Spoonable into your next cup of coffee, tea, oatmeal or bowl of cereal and you’re ready to take on the day! Try Truvia® in your favorite easy-to-make recipes to add natural, calorie-free sweetness to your everyday diet – it really is that simple! That new salad dressing recipe that you’ve been wanting to try? Swap Truvia® Natural Sweetener for sugar and you have a new family favorite that’s sure to please. Did you know that one packet of Truvia® Natural Sweetener provides the same sweetness as two teaspoons of sugar? Check out the Truvia® conversion chart here to see how easy it is to start substituting today! 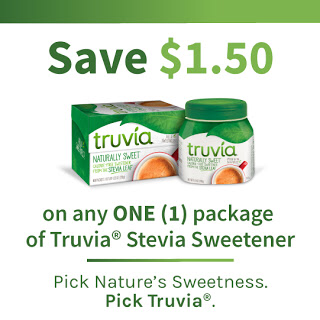 From now until 4/30 you can save $1.50 on any ONE (1) package of Truvia® Natural Sweetener! Check out this amazing offer here before it’s gone, and find Truvia® at a store near you! Literally all we use in our house for coffee, baking, etc. WE love it! I've never tried sweetener in drinks or cooking but I like the idea of natural sweetener. I might check this one out. Thanks! I have thought about trying Truvia, as I do use way too much sugar in my coffee and I am certain that's not helpful for me. I will have to check it out now that I read this! I only use sweetener in tea. I did try Truvia when it first came out and was surprised at how different it tasted then typical artificial stuff you find in packets. I know a lot of people who swear by this stuff! I haven't actually tried it myself yet but I really should. I love using Truvia too! It's so good in different recipes to make them healthier. Natural Sweetener is so much better! Especially when trying to cut regular sugar out.